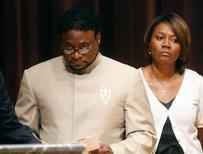 ATLANTA, Ga. - For the first time, one of the men filing suit against Bishop Eddie Long is speaking out. In an exclusive interview with FOX 5 senior I-Team reporter Dale Russell, Jamal Parris tells a story of what he calls a love-hate relationship with a man he called "daddy." Following Bishop Long's sermon on Sunday, Russell caught a plane to Colorado, which is home to Jamal Parris-- the oldest of all the accusers in the case. In a parking lot, late at night, Parris told Russell a story of love, anger, and desire to protect other young men. Jamal Parris didn't want to talk at first, but before he left us, he had plenty to say about Bishop Eddie Long. "You look at our eyes," Parris said. "You hear the pain in our voice. We have no reason to lie to this man." Jamal Parris is one of four young men who have filed sexual misconduct lawsuits against Bishop Eddie Long, accusing him of using scripture and church money to sexually seduce them. "I am not the man being portrayed on the television," Bishop long told the congregation at New Birth Missionary Baptist Church on Sunday. "That's not me." On Sunday, Bishop Eddie Long spoke for the first time, never flatly denying the claims, but vowing to fight. "I feel like David against Goliath," Long said. Since last week, none of the four young men have talked publicly about the lawsuit-- until now. We found Jamal Parris shopping at a 24-hour store in Colorado. Initially, he was reluctant to talk. But once he started, he told a riveting story about how as a young teen-- a 14 year old with no father in his life-- he joined New Birth Missionary Baptist Church. Bishop Eddie Long came into his life. He said Long said to call him "daddy" and to trust him with spiritual guidance.